Notes: This hardy crab is found in shallow waters all over the Caribbean. Its main food staple is detritus found in the substrate. These workhorses will need larger shells as they grow and can topple rock work when full size. House with peaceful fish such as tangs and rabbitfish. 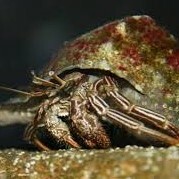 These crabs may attack snails in search of upgrading their shells; keep a supply of trade-up shells on the substrate.